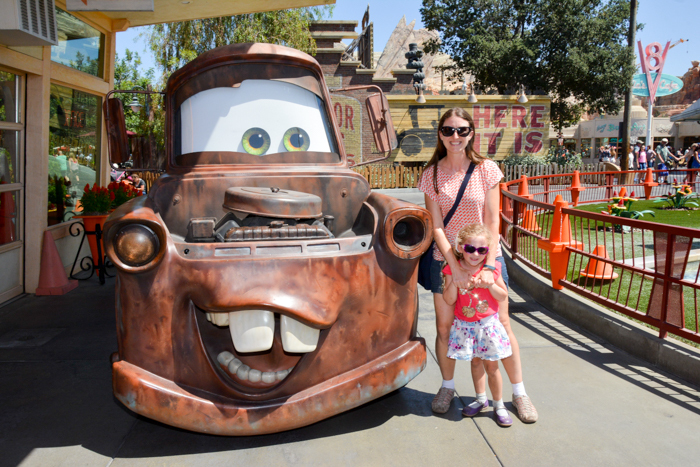 LA Family Attractions: 16 Things To Do In Los Angeles With Kids - Adventure, baby! 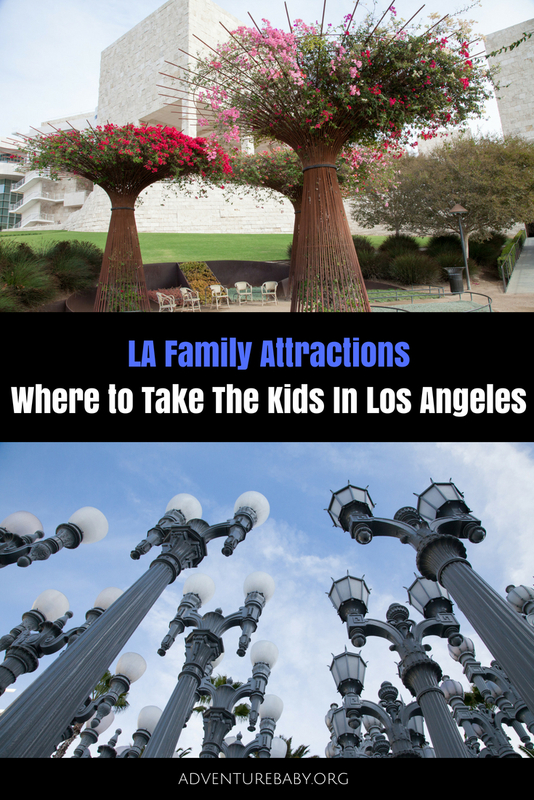 Los Angeles is an incredible destination for a family holiday. We discovered world-class museums, theme parks and gardens during our stay that left us extremely impressed with that the city has to offer visitors of all ages and interests. 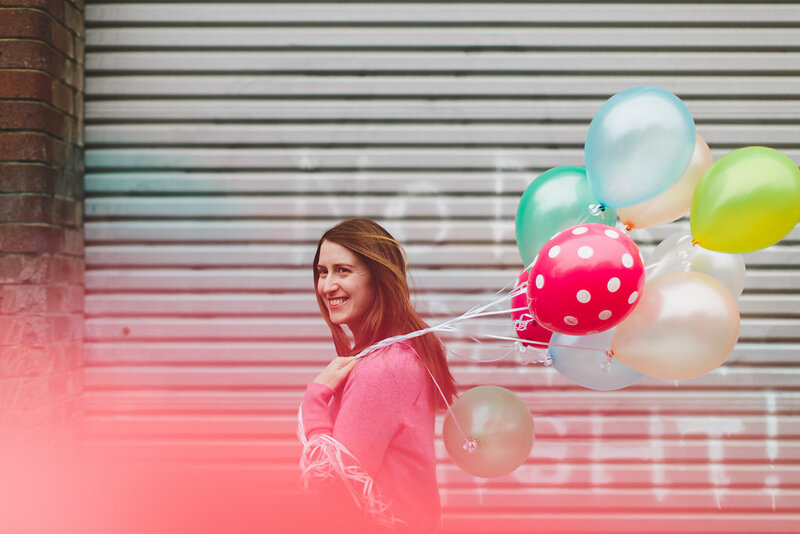 Scroll down to find out our favourite LA family attractions, plus where to stay and eat with kids, and how to get around the city without losing your sanity. 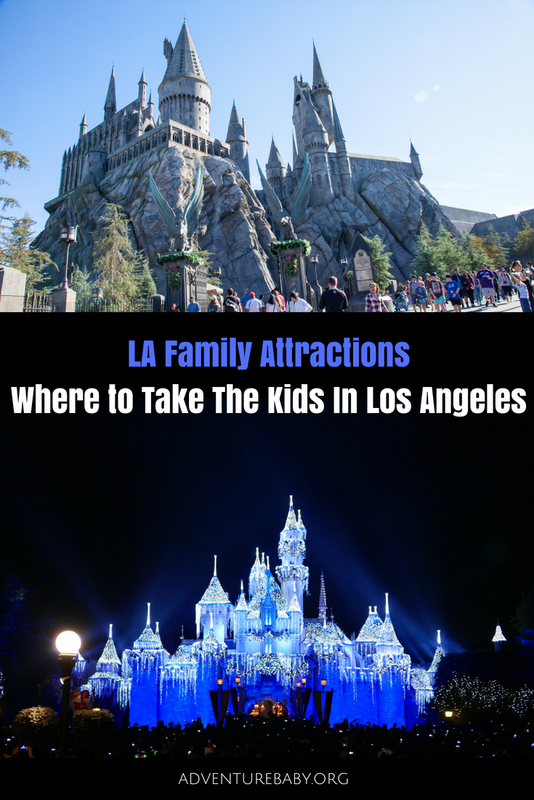 This is a must when visiting LA with kids. 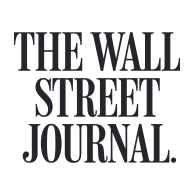 The J. Paul Getty Museum, usually just called “the Getty”, is one of the world’s largest art organisations. 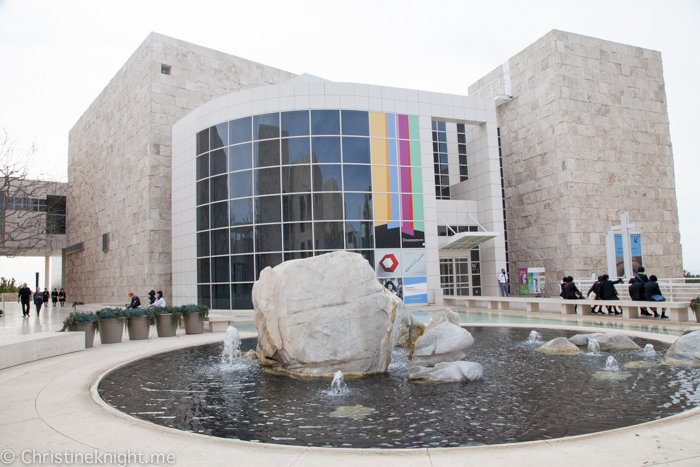 In Los Angeles, you can visit their two locations and collections: the Getty Center and Getty Villa. Both are incredible and I would suggest setting aside a day to explore each. 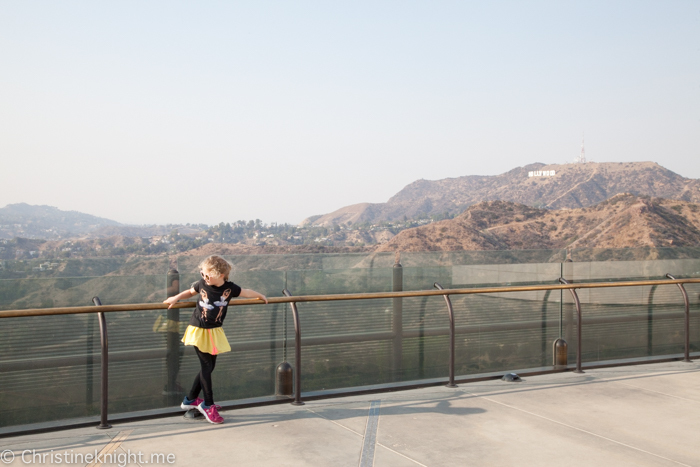 Perched atop a hill with a stunning view over LA, the Getty Center is worth visiting to see it’s incredible architecture and gardens as well as their art collection. Visit the Family Room with kids to explore art with hands-on activities such as mask-making, playing with camera lenses, creating a tube sculpture and decorating a giant illuminated manuscript. .
Or, use the Art Detective Cards to engage kids in art around the galleries and garden. 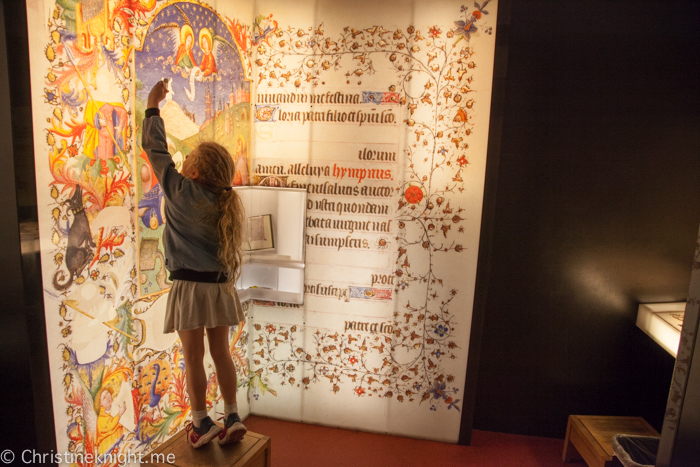 There is even a free multimedia GettyGuide® Family Tour with stories, music, and sounds inspired by art available at the GettyGuide Desk in the Museum Entrance Hall. Read more about our visit to the Getty Center here. 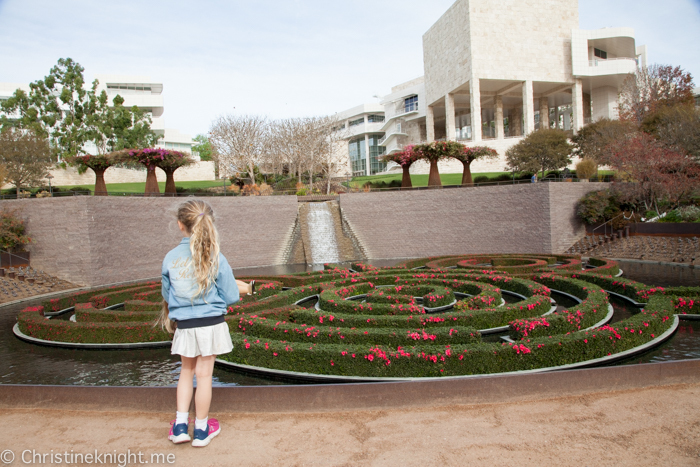 Entry into the Getty Center is free! 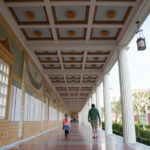 Another must-visit in LA, the Getty Villa is a recreation of an ancient Roman country house, built in the 1970s and modelled after the Villa dei Papiri in Herculaneum, Italy, which was buried by the eruption of Mt. Vesuvius in A.D. 79. The villa is filled with artefacts and art works from the end of the Stone Age to the fall of the Roman Empire, while the garden design reflects those found in ancient Roman homes including a herb garden, decorative fountains, arbors and reflecting ponds. 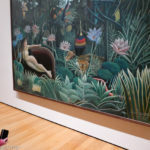 We spent a peaceful few hours walking through the gardens and villa following the Art Detective Cards, which direct families to find art and solve a mystery while exploring the galleries, garden, and architecture. 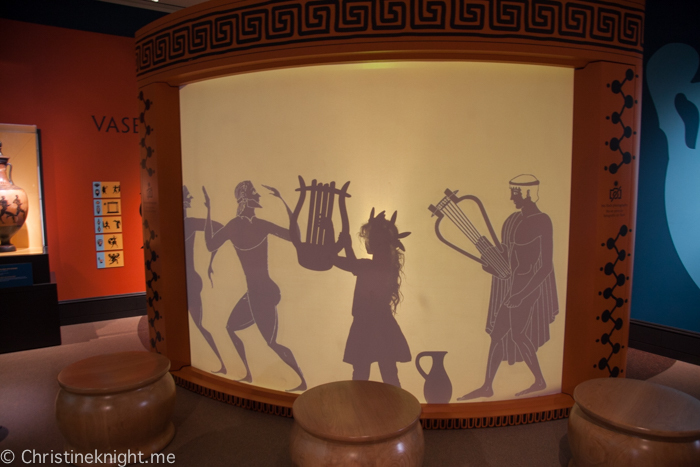 The interactive Family Forum room is a highlight of a visit to the Getty Villa with kids, as is the GettyGuide® Family Favorites multimedia tour designed especially for families. 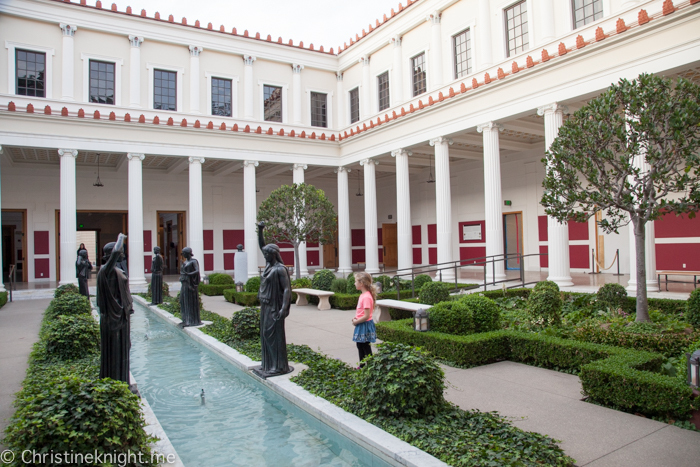 Read more about our visit to the Getty Villa here. 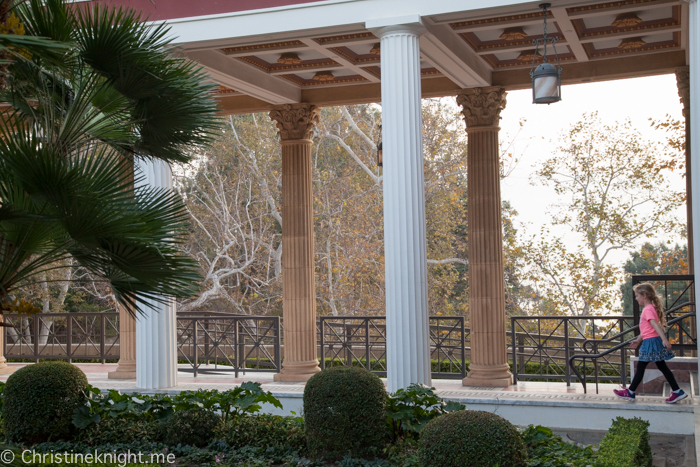 Entry into the Getty Villa is free, but ticket reservations are required. 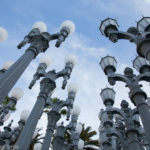 The iconic Los Angeles County Museum of Art (LACMA) in the Miracle Mile area of Los Angeles is a must-visit for any lover of art and design. 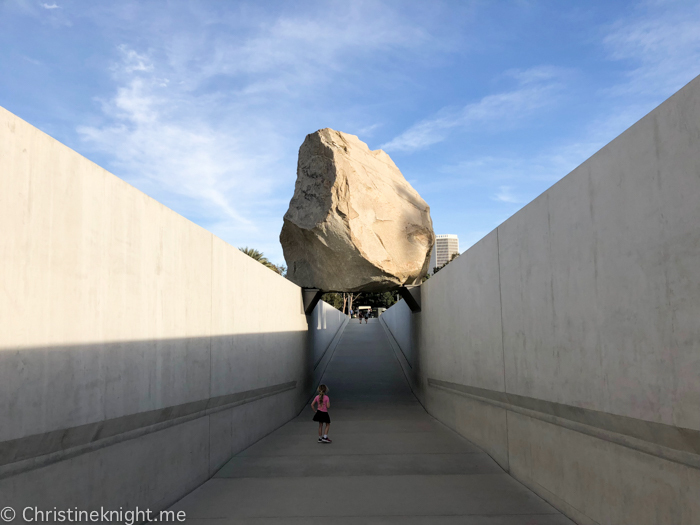 Kids will love the two outdoor, large-scale installations, Urban Light and Levitated Mass, the Boone’s Children’s Gallery, free story time and family Sunday activities. 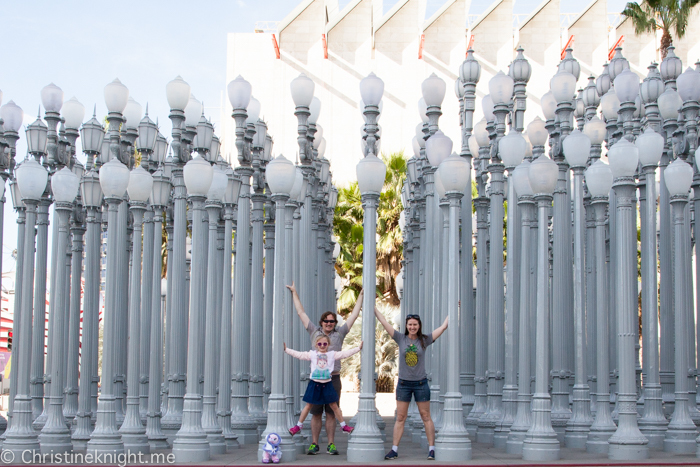 Read more about our visit to LACMA here. 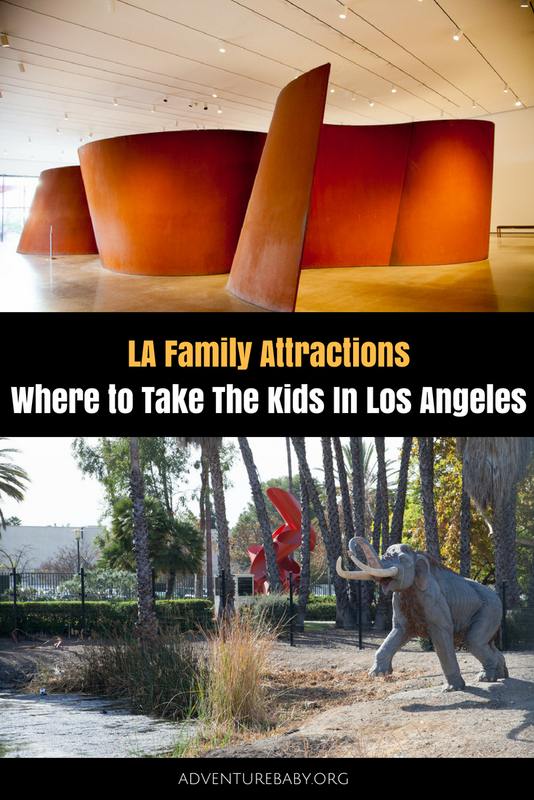 The La Brea Tar Pits and museum will educate and engage the whole family. 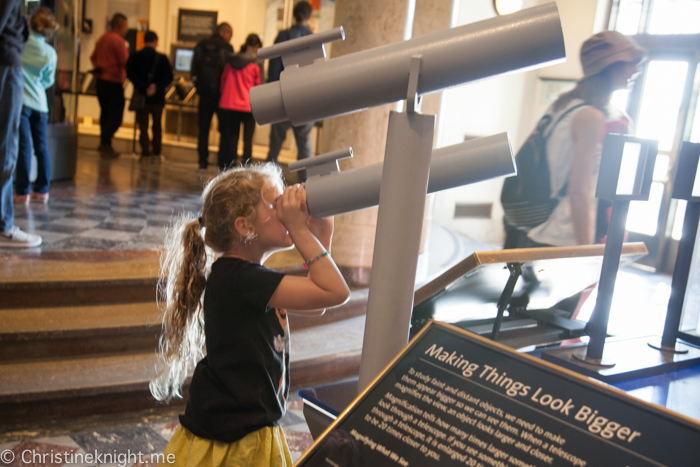 Science-lovers of all ages will get a real kick out of visiting this incredible time capsule, where active tar pits are still being excavated and Ice Age fossils of long-extinct animals being still being discovered today. 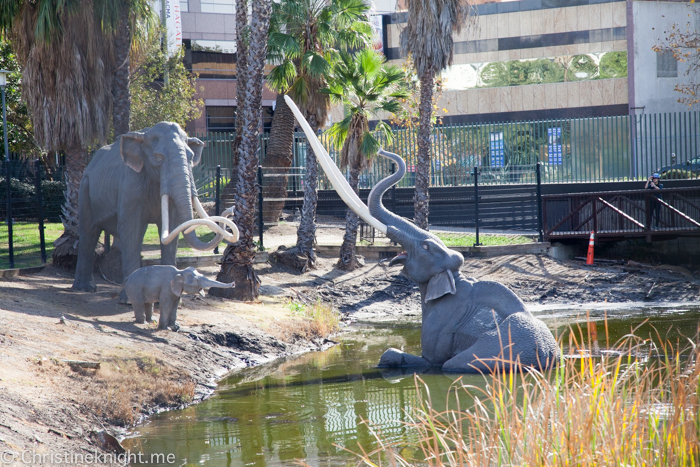 We absolutely loved our visit to the La Brea Tar Pits and highly recommend it as one of the top LA family attractions. 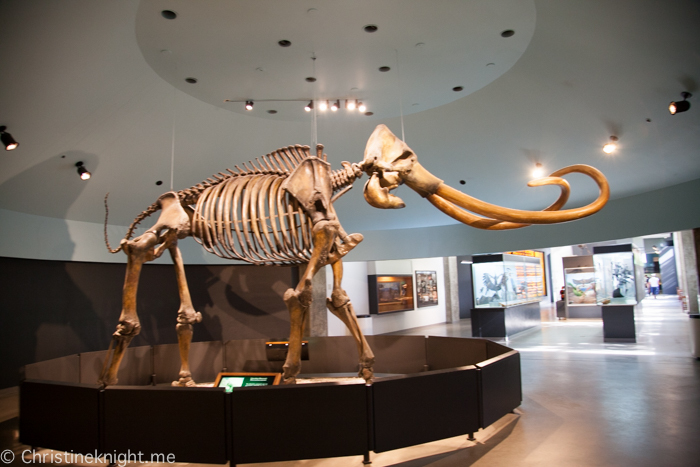 Read more about our visit to the La Brea Tar Pits and Museum here. Universal Studios Hollywood is a film studio and theme park in the San Fernando Valley area of LA. It’s the original Universal Studios! The park is split into an upper and lower lot with rides and attractions, plus the original Back Lot Studio tour that is unique to Hollywood. 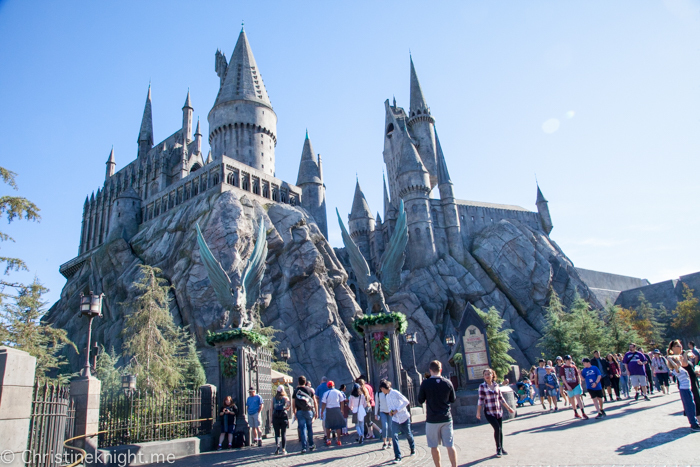 The Wizarding World of Harry Potter is a stand out. 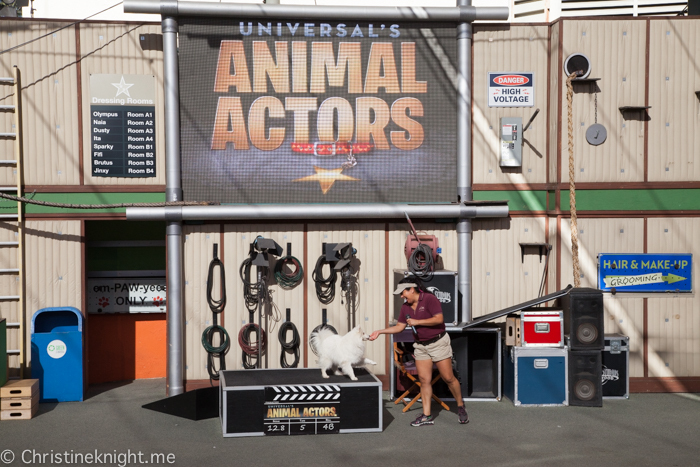 Get our tips on visiting Universal Studios Hollywood here. 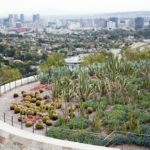 One of the largest municipal parks with urban wilderness areas in the United States, Griffith Park sprawls over 4,210 acres featuring both natural terrain and landscaped parklands. There are plenty of walking trails in the park, as well as some prime attractions. 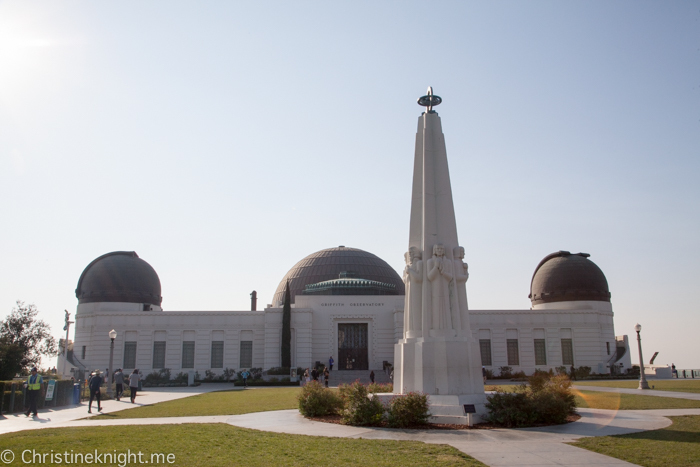 Read more about our visit to the Griffith Observatory here. It might not look like much, a dilapidated merry-go-round that’s a a bit neglected and worse for wear, but the Griffith Park Merry-Go-Round is a special place for Disneyphiles. 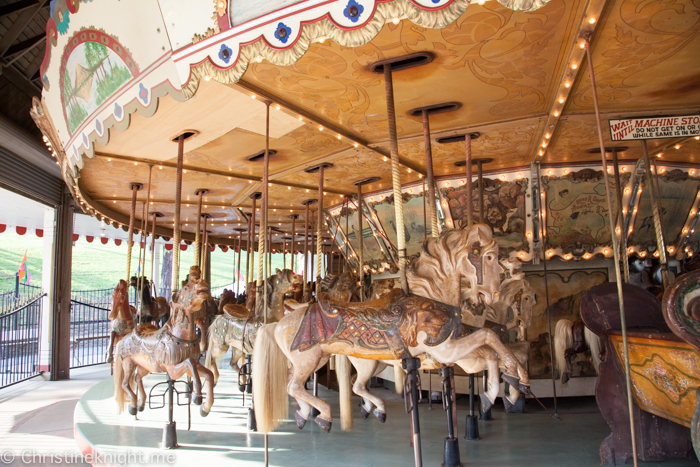 This carousel with peeling paint, in need of some serious restoration, was actually the inspiration behind Disneyland. 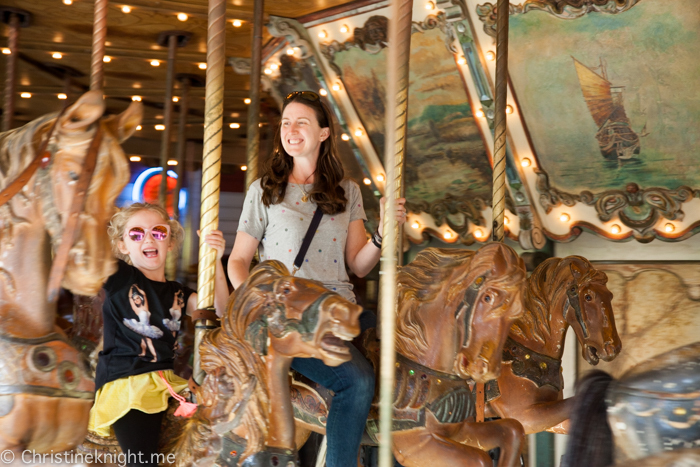 Read more about visiting the Griffith Park Merry-Go-Round here. 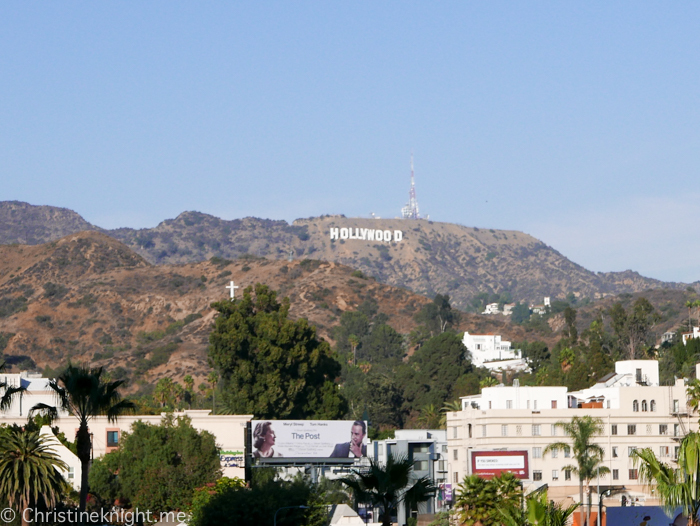 One of the most famous symbols in the world, the Hollywood sign was erected in 1923. 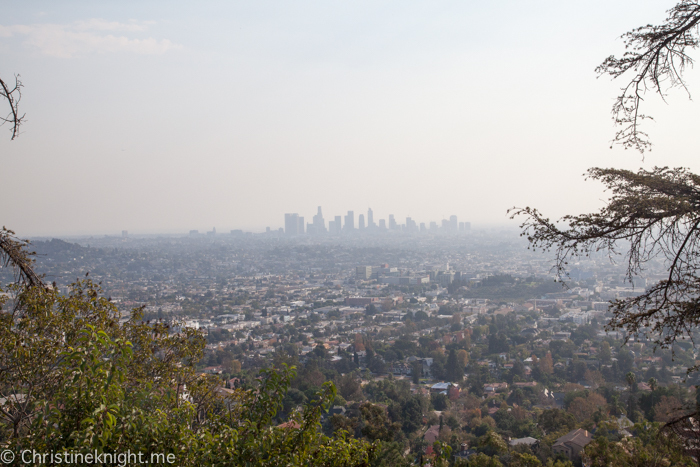 While it’s visible from many places in Los Angeles, you can actually hike right up to it. 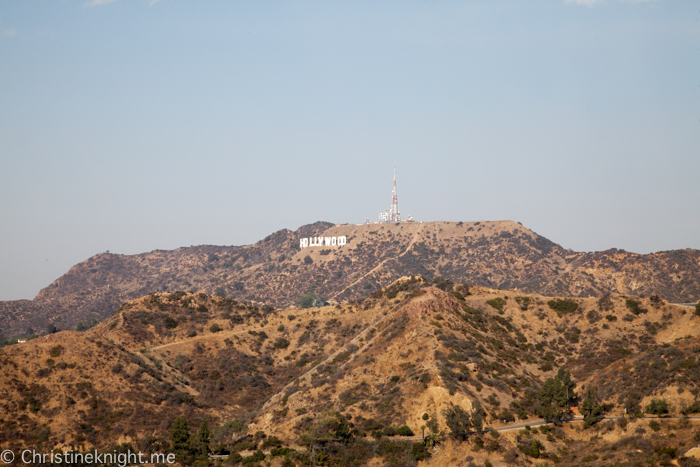 Get tips on hiking up close to the Hollywood sign here. A 133-acre zoo located inside Griffith park, the Los Angeles Zoo and Botanical Gardens was founded in 1966. Inside the zoo you’ll find animals such as Bornean orangutans, Asian elephants, hippos, gorillas and chimpanzees. Kids will love petting farm animals in the Winnick Family Children’s Zoo and running wild at the Neil Papiano Play Park that features animal-themed climbing sculptures, large play structures, a toddler area and water misters. The play park was designed to be accessible to all children, including those with medical and physical challenges. 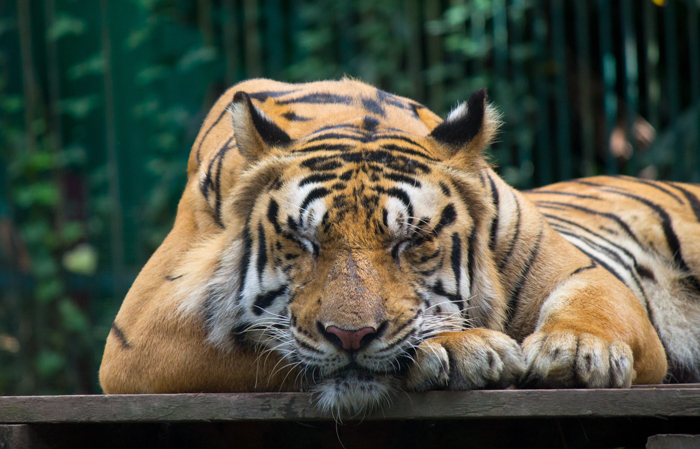 If your kids want to see animals, then the zoo is an excellent choice of LA family attractions. The people watching at Venice Beach makes it worth the visit alone! 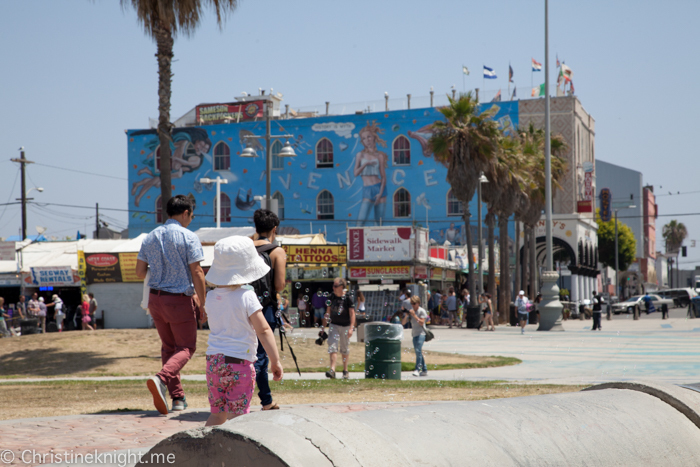 There is a boho vibe at Venice Beach, with a boardwalk full of funky shops, street performers and murals. We found a playground and skate park for kids to enjoy, and the Muscle Beach outdoor gym for us to watch the locals training to be musclemen like Arnie! Enjoy food from over 100 gourmet grocers and restaurants at the Original Farmers Markets, an LA institution since 1934. We loved the open-air setting which made for low-key dining in a vibey atmosphere. 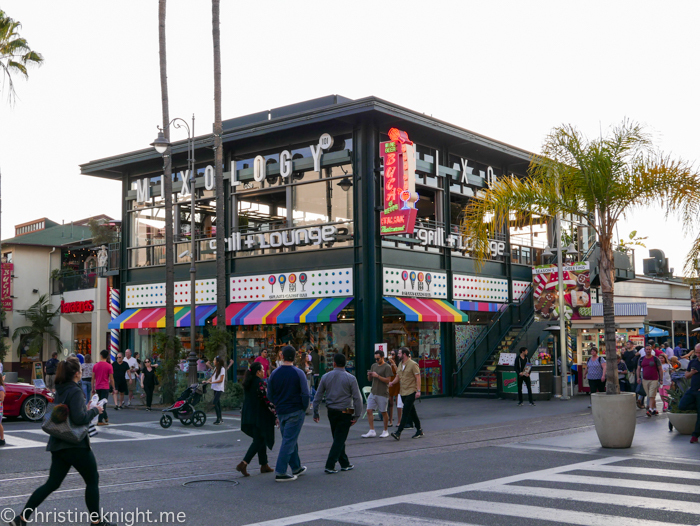 This famous outdoor mall is a must if you love to shop! 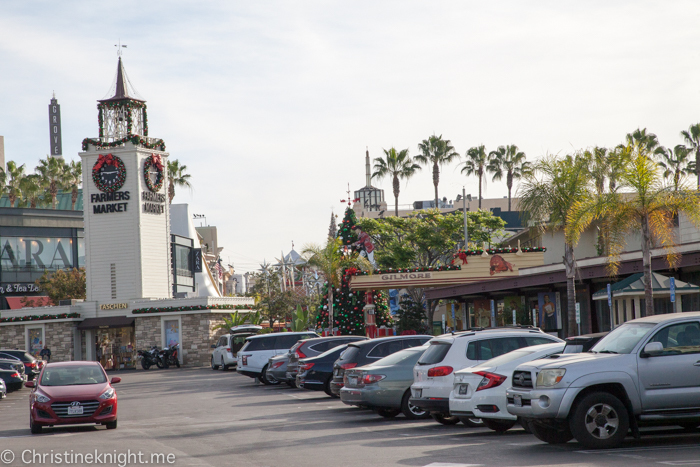 The grove is packed with world-class shops, restaurants and entertainment, plus offering a bit of fun with old-fashioned trolley rides and dancing fountains. The American Girl Doll store was a fave for us. Our doll had her hair done and ears pierced in the salon. 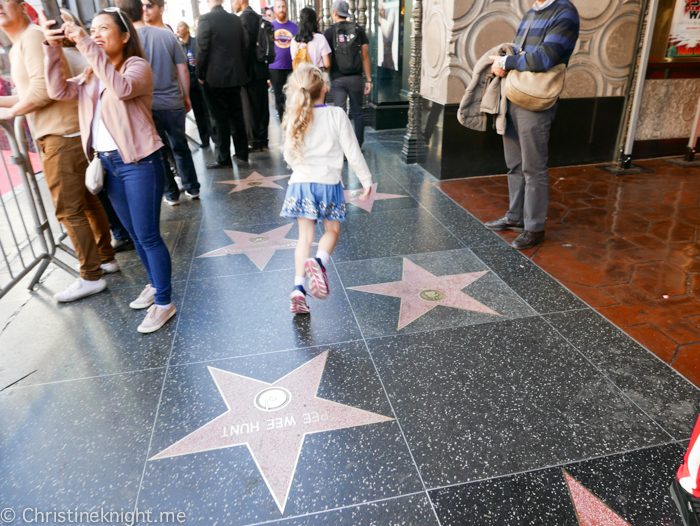 Movie buffs will want to visit the iconic Hollywood Boulevard, the famous strip lined with museums, theatres and 2,500 stars on the 18-block Hollywood Walk of Fame. 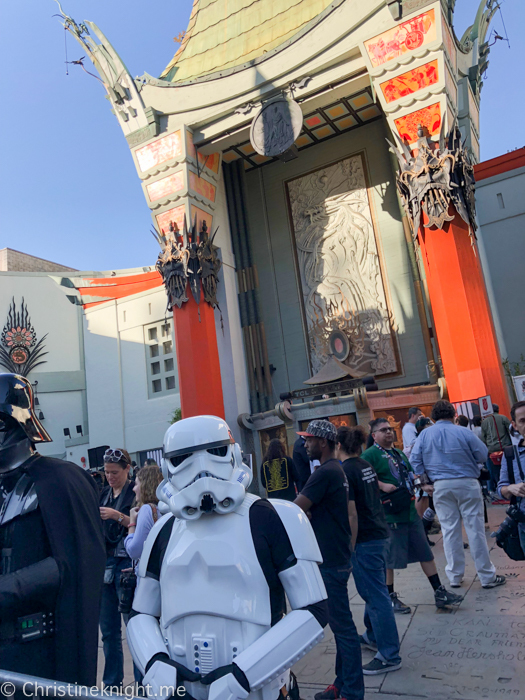 The Hollywood Wax Museum and Madame Tussauds Hollywood are both a fun way to spend a few hours “meeting” the stars, or you can see if your hands and feet match up with famous celebs’ in the TCL Chinese Theatre’s Forecourt to the Stars. Catch a movie while you’re there! 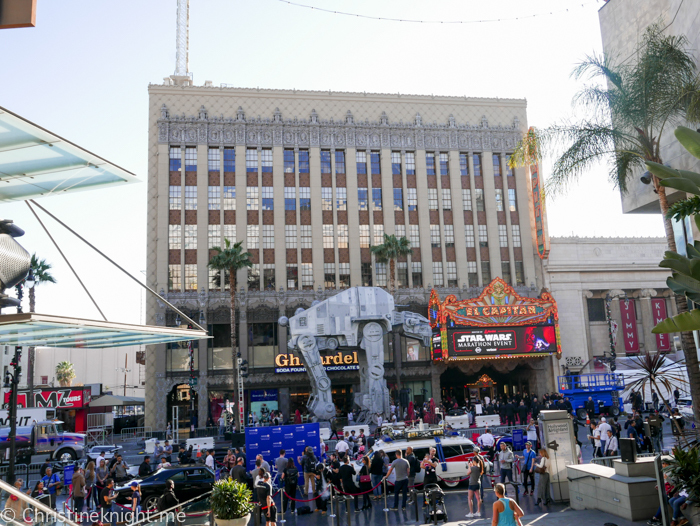 The TCL Chinese Theatre is home to one of the largest IMAX© auditoriums in the world, and the Dolby Theatre, where the Academy Awards are held every year, plays live shows year-round. Since we are Disney fans, we had to visit the El Capitan Theatre. Owned by the Walt Disney Company, the theatre shows Disney movies, often with great movie-themed exhibits. 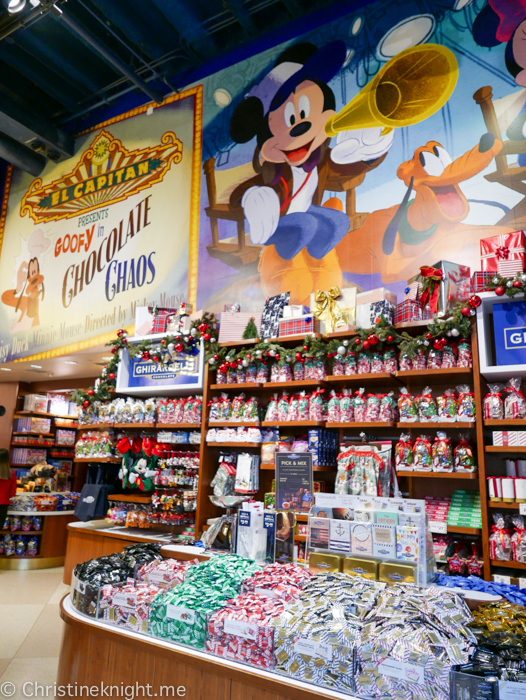 Attached to the theatre is the Disney Studio Store & Ghirardelli Soda Fountain, where you can try an incredible sundae and buy exclusive Disney pins and merchandise. 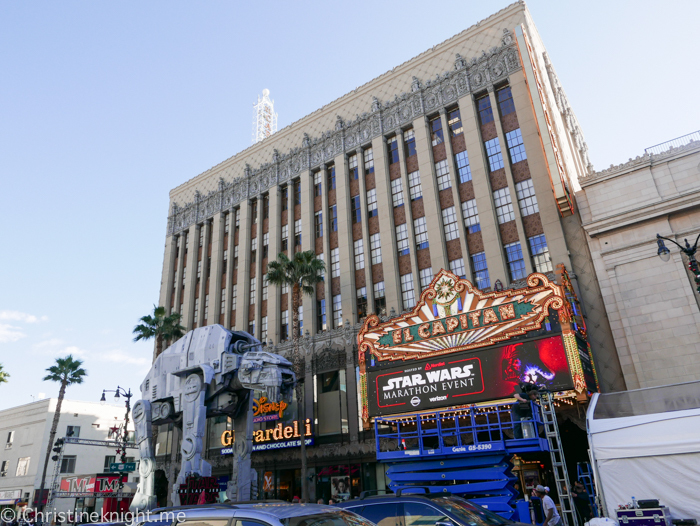 When we visited we were lucky enough to see the new Star Wars premiering, including a life-sized AT-AT Walker in the street. 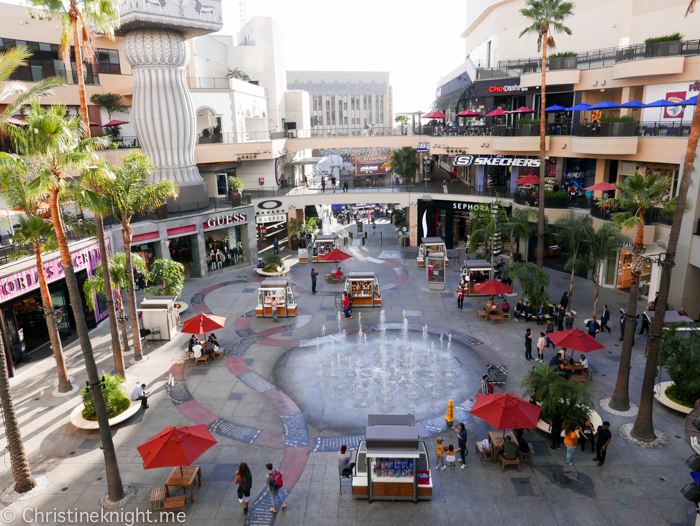 The Hollywood & Highland Center is a great spot on the strip to eat and shop, and has fountains in the forecourt for kids to play in. There is also a great view of the Hollywood sign inside. We found the strip to be quite seedy and filled with people who would try to give you something like a “free CD” and then ask for money for it, so keep your wits around you and your valuables close. 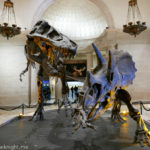 The largest natural and historical museum in the western USA, the Natural History Museum of Los Angeles County’s collections include nearly 35 million specimens and artefacts from across 4.5 billion years of history. 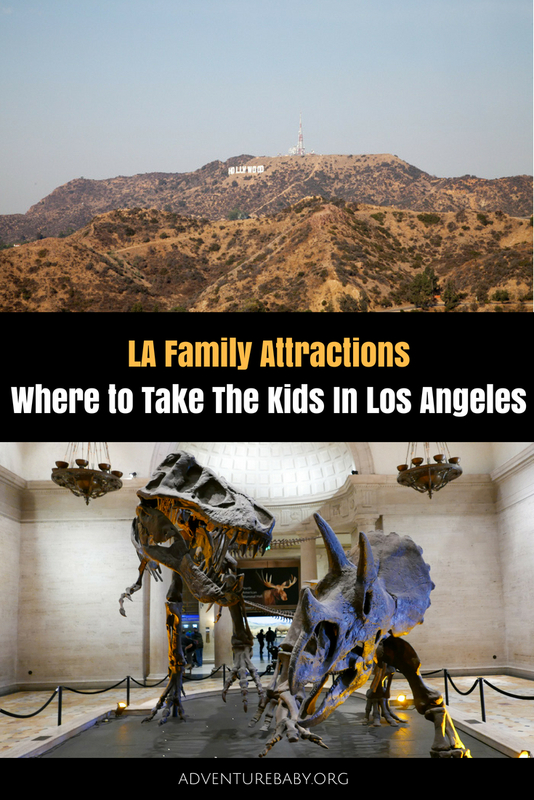 There is plenty for kids to do at the NHMLA, from multi-media stations where they can “excavate” their own fossils, to the Discovery Center featuring a fossil dig pit, live bugs and a daily dinosaur puppet show. 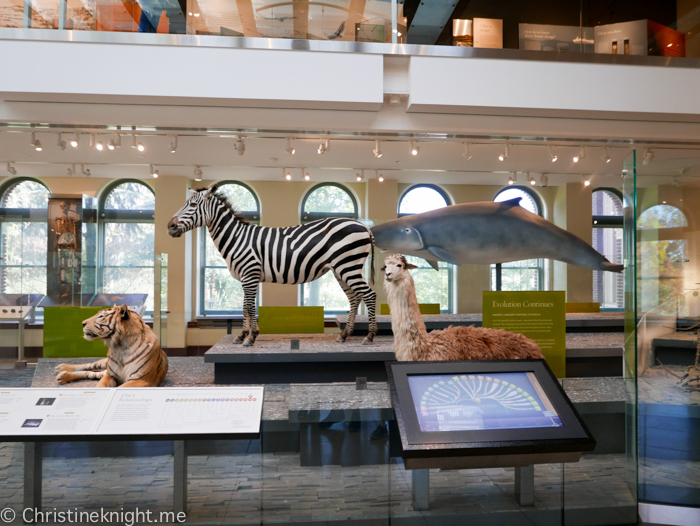 We were extremely impressed with the NHMLA and rate it as one of our fave LA family attractions. 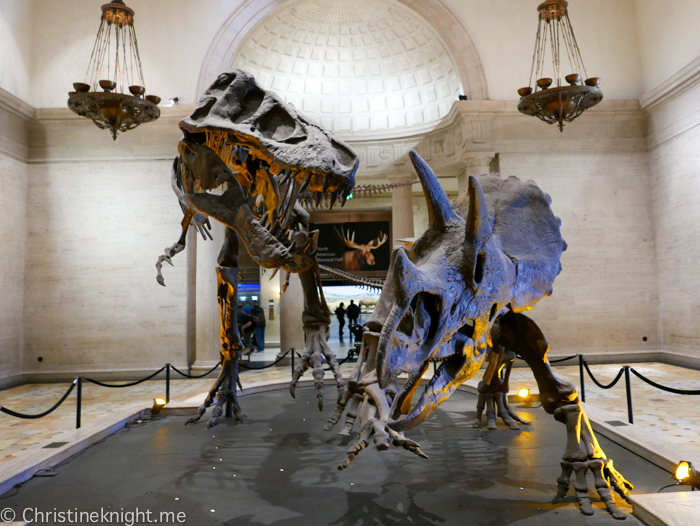 Read more about our visit to the Natural History Museum of Los Angeles County here. 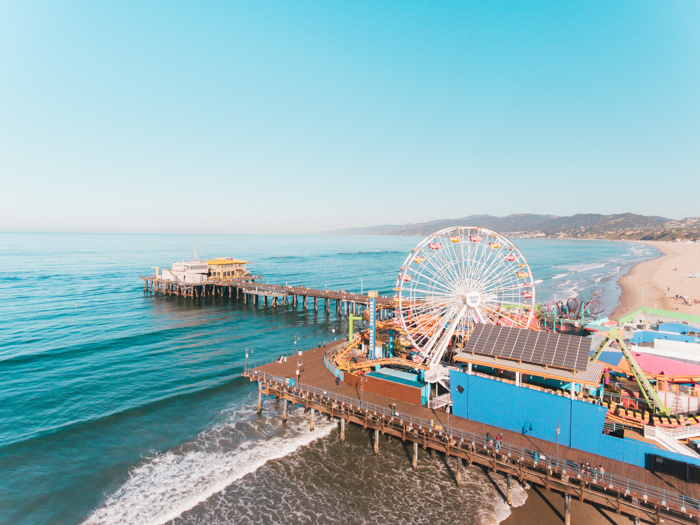 An hours drive south of Los Angeles will bring you to Anaheim, and the original Disneyland theme park. Disneyland park opened in 1955 and still retains many of the original rides and much of the charm that it had upon opening. California Adventure Park opened across from Disneyland in 2001. I’m a massive Disney fan and my daughter is the same. 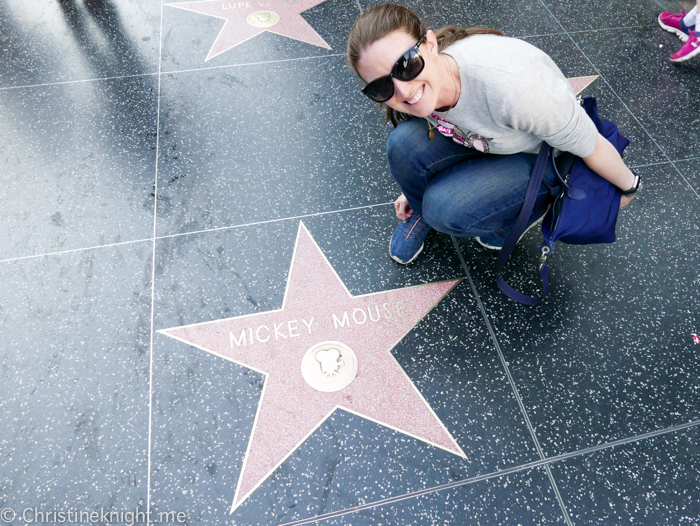 It goes without saying that if you visit LA and even kind of like Disney, then you must, must, must visit Disneyland. It’s my number one choice of LA family attractions and the one that we re-visit over and over and over again. We visited during last December, which was absolutely magical. 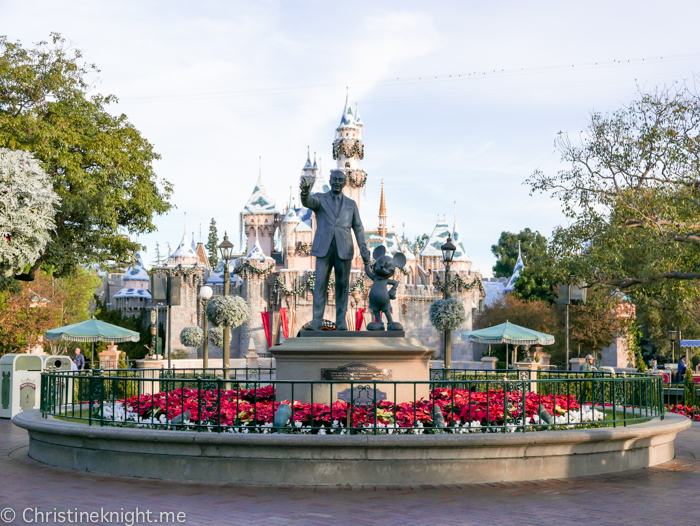 Read about visiting Disneyland during the holidays here. 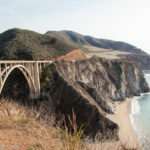 Get lots of tips on visiting both parks here. Driving is the easiest! If you hire a car and can put up with exhorbitant parking fees at the hotels, then I would advise driving as it’s simplly the easiest way to get everywhere. LA does have a metro system so if you’re planning on using it, I would advise staying near one of the train stations. Get more info on the metro system here. Uber is also very easy to use in LA. If you require a car seat, see here for info. We always travel with our own car booster seat. The Hollywood Orchid Suites, directly behind Hollywood Boulevard, has a fantastic location and is excellent value. We had an apartment-sized suites featuring a full kitchen. We also received complimentary breakfast every day. A few steps outside of the hotel took us to the Highland Mall with plenty of restaurants and shops, and Hollywood Boulevard on the street parallel. The hotel staff were extremely warm and welcoming and we would happily stay again. Get more info on the Hollywood Orchid Suites here. 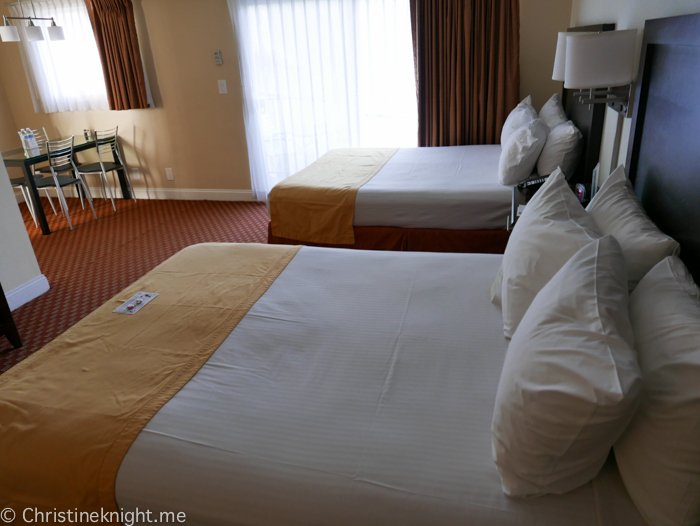 Beverly Laurel Motor Hotel is a budget hotel with a cool retro vibe and a nice-sized pool. The location is excellent for the Grove shopping center, Original Farmers Markets – both are within walking distance. We also walked to LACMA and La Brea Tar Pits from here. The Beverly Laurel was an adequate hotel but lacked the warmth and attention to detail of our other hotel and we wouldn’t stay again. Get more info on the Beverly Laurel Motor Hotel here. 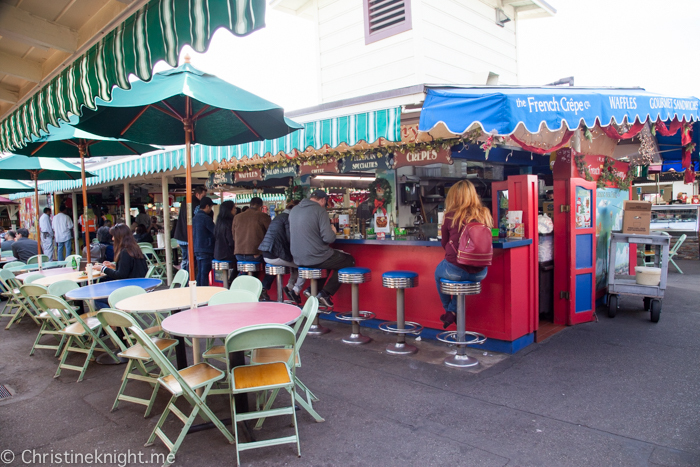 A popular spot for locals and tourists alike since 1934, even the fussiest eater will find something they like from the 100 gourmet grocers and restaurants inside. Pricey but delicious old-fashioned sodas, ice cream sundaes and chocolate inside the Disney Studio Store. Located on Hollywood Boulevard inside the El Capitan Theatre, the soda fountain is a welcome haven from the busy boulevard outside. 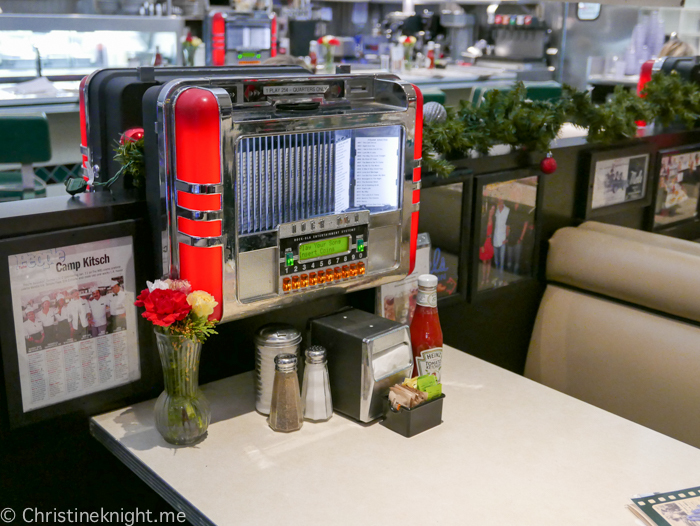 A retro-style diner featuring a wide menu of standard diner fare and jukeboxes at the tables. Mel’s has plenty of options for kids and adults. Who doesn’t love pizza? We frequented the CPK brand inside Highland Mall in Hollywood multiple times. They also do pasta and salad.